Eight peace activists were arrested on September 8 at the “Plant Peace, Not Nukes! – Groundbreaking for Works of Mercy, Not Works of War” held at the entrance of the planned site for the new nuclear weapons parts plant in Kansas City, Missouri. It was an alternative ground breaking ceremony to the billion-dollar replacement for the Honeywell nuclear weapon parts plant that was taking place at the same time, with local and national officials touting the new plant’s local economic and national strategic importance to 500 guests. The eight peace activists broke off from the larger group of 70 “Peace Planters”* and stood or knelt in front of three large VIP buses trying to come onto the site and attend the official ground breaking ceremony. 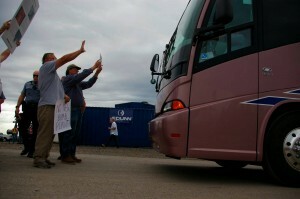 The buses were delayed for about 10 minutes until Kansas City police were able to arrest the eight activists and clear the entrance. Seven were handcuffed and transported by police vans to jail. All seven were booked, charged with disorderly conduct and released on promises to return to Kansas City for a November 4th, 9 a.m court appearance. Kansas City activist Sahijkaya, who was initially placed under arrest, was not transported or charged. Sahijkaya is physically handicapped and was arrested in her electric scooter. We are looking into the causes for this discrepancy. *The KC Peace Planters is a broad-based coalition founded by PeaceWorks KC, the KC chapter of Physicians for Social Responsibility, and East Meets West of Troost. Story and photos by Joshua J. McElwee, National Catholic Reporter here.